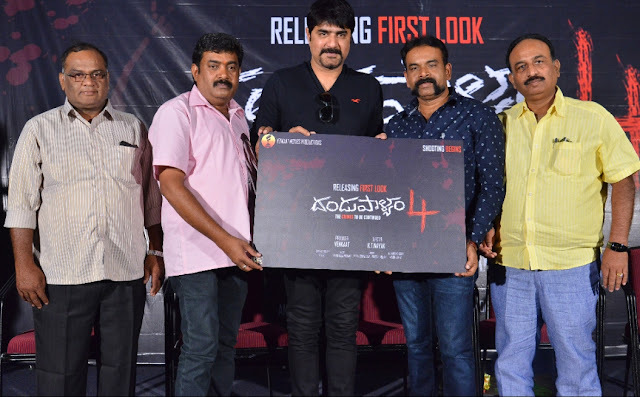 The First Look of 'Dandupalyam-4' was launched on Wednesday by hero Srikanth. Srikanth said, "I am happy for the entire team. The first two parts were really hard to make. And we all know what kind of big hits they were in Karnataka. Many suggest to me that I should do sequels to my hits like 'Pelli Sandadi' and 'Mahatma'. But it didn't happen. In the case of Dandupalyam, not four but much more can be done because of the nature of the subject. I wish the team all the best." Producer Venkaat said, "The craze for the brand Dandupalyam has only increased over the years. The director of the first three parts was someone else. Even though the audience didn't know much about the director and the artists, they lapped up the first part in a big way. Our efforts didn't go waste. The brand has stood the test of time. People remember the first part to this day. As for 'Dandupalyam-4', our director KT Nayak garu is a very intelligent person. As a technician, he is special. He is a hard-worker and a lover of the crime genre. The craze for the second part was more than that for the first part, just as is the case with the 'Baahubali' movies. But in Telugu, the second part couldn't be as great as the first one. We are keeping this in mind and are going to work extra hard on the fourth part. The film will be shot from March 8 onwards." The producer added that the element of criminal gangs and police investigations is like an ocean that can be explored repeatedly. "The story of 'Dandupalyam-4' is not entirely imaginary. The basic story is inspired by real events. The film tells the story of a new gang and an old gang. It's commercial, unlike the first three movies," he adds. Director KT Nayak said, "As the producer said, I love the crime genre a lot. Although people tell me I look very soft, I can make a raw film. I will do the talking after we shoot the movie." To be produced on Venkaat Movies, the film will star Makarand Deshpande, Pooja Gandhi, Ravi Kale, Petrol Prasanna, Muni, Jaya Deva, Karisubbu, Ravi Shankar, Sneha, Sanjeev, Arun Bachchan, Somu, etc.